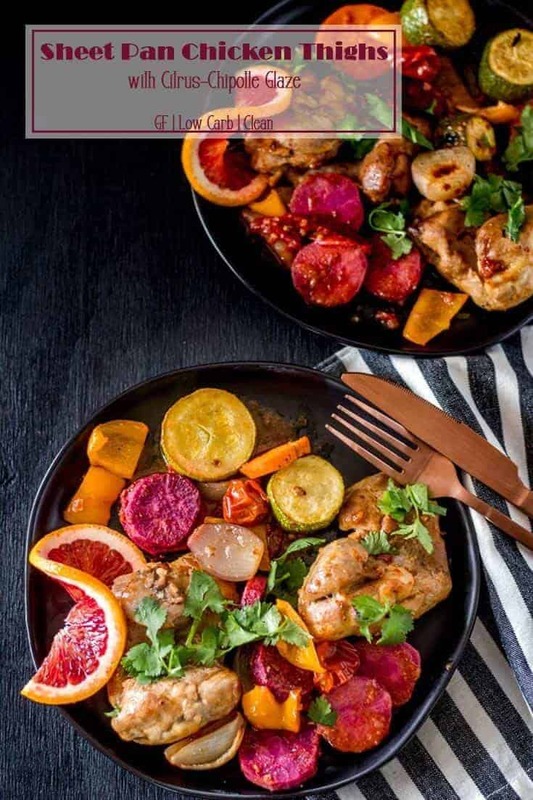 A little sweet heat does wonderful things for Sheet Pan Chicken Thighs with Citrus-Chipotle Glaze! 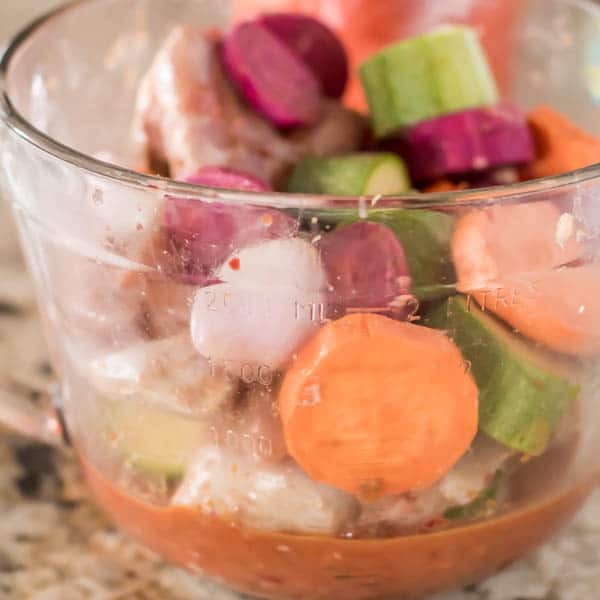 A blend of citrus juices (and their zest), the smoky heat of chipotle en adobo, cumin, garlic, and olive oil make a flavorful glaze for your favorite vegetables, and of course, the chicken thighs. Why a Sheet Pan Dinner? 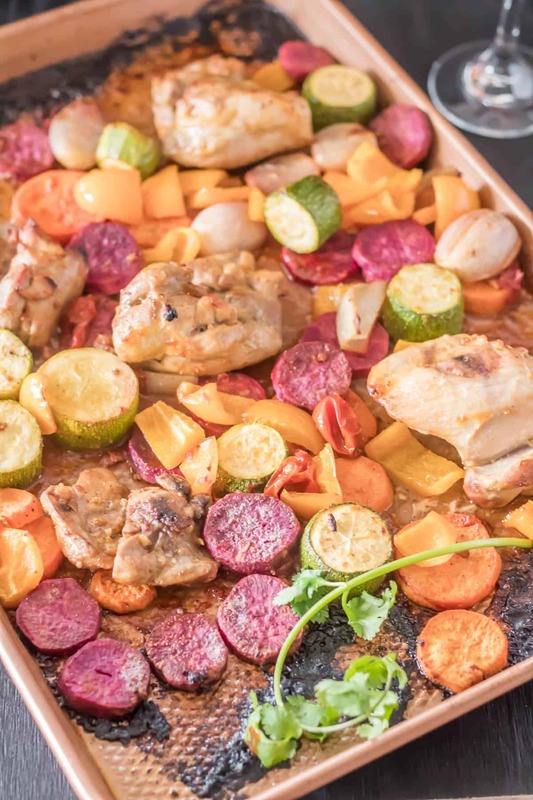 “Sheet pan dinners” are trending, and with good reason. Roasting tends to be a healthy and flavorful cooking method, and ONE. PAN. Less clean up time means more time to sit and enjoy a nice meal (with or without a glass of wine!). 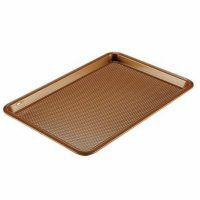 My biggest concern when creating a “sheet pan dinner” is cooking times. It’s easy to come up with flavors that work with all the ingredients. Cooking times? Not so much. Admittedly, chicken breast is not my favorite. I do acknowledge its health benefits, and I use a good amount of it. However, I do not roast it. I see a lot of sheet pan dinners that include chicken breast, and they evoke images of shoe leather. 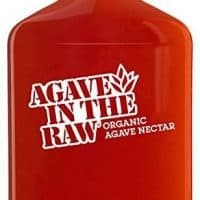 Is that TMI? 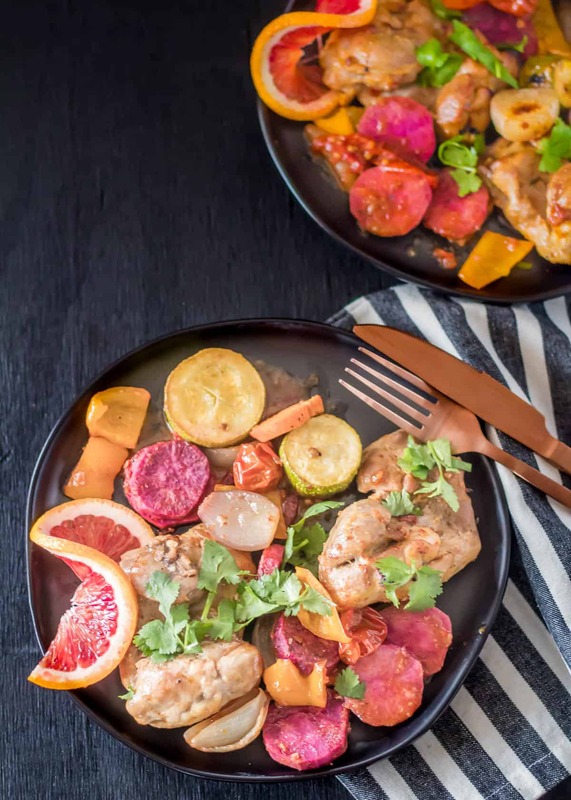 When I began working on Sheet Pan Chicken Thighs with Citrus-Chipotle Glaze, I knew I wanted to use chicken thighs – while a bit higher in fat and calories – they’re more forgiving with cooking time. The chicken thighs require about 20-30 minutes on 400° making them a good candidate for roasting alongside sweet potatoes. However, the sweet potatoes can take up to an hour unless they’re sliced fairly thin (as opposed to wedges or chunks). Given the Mexican flavors in this dish (cumin, citrus, chipotle), I wanted to include Mexican grey squash (or zucchini). The trick is to get the sweet potatoes tender without having mushy squash! I cut the squash in fat chunks. Problem solved. The roasted shallots are a wondeful addition, but you can use wedges of red or sweet onion if you prefer. Round out the ingredients with colorful bell pepper chunks and tiny tomatoes. I wax poetic about colorful food… This dish can be very colorful! I chose a ruby sweet potato and a purple yam, orange bell pepper, shallot, multi-colored tiny tomatoes, and Mexican grey squash to join my boneless, skinless chicken thighs on the baking sheet. They all got tossed with a yummy citrus-chipotle glaze, before going into a preheated 400° oven (375° convection). Convection roast saves about 20% on time, and my dinner was perfectly roasted in about 25 minutes. The thickness of the thighs determines the cooking time. Double-check the root vegetables to make sure they’re tender! Quote of the day: Hubby says “the purple yam” (when cooked) “looks like salami in the dish.” 😂 Seriously, though, purple yam is loaded with anthocyanins, and is a super healthy and tasty way to get your veggies! Lastly, it’s blood orange season… Yay! I look forward to them every year, and this year they were a bit late. If you can’t get them, substitute your favorite orange. 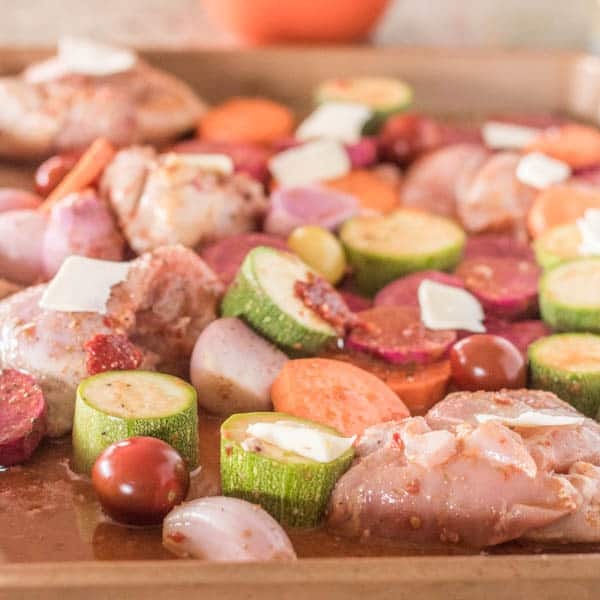 Roasted veggies and boneless, skinless chicken thighs coated with a citrus-chipotle glaze is a great riff on the trending "sheet pan dinner." Preheat oven to 400 degrees (375 convection roast). 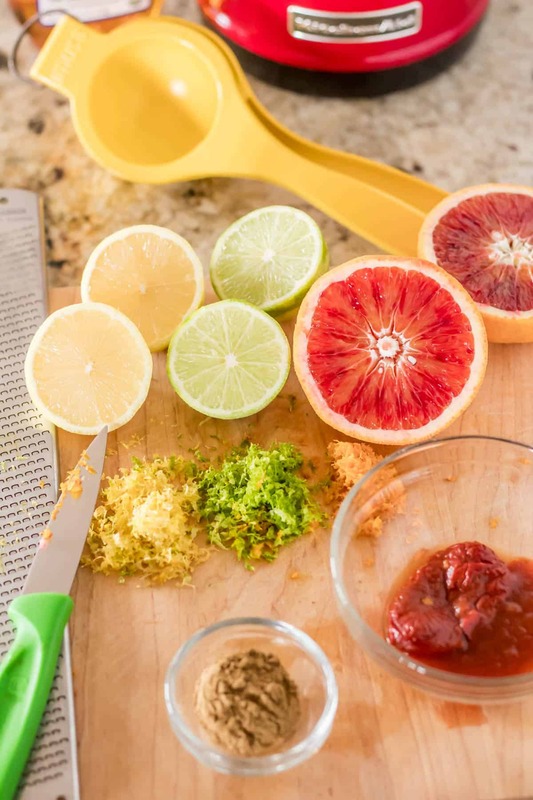 Add the glaze ingredients to a small food processor. Pulse until full. 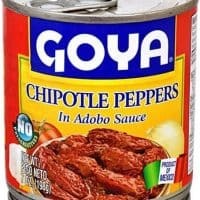 Add to a large bowl. Add the prepared vegetables and chicken to the glaze. Toss to coat. Using a slotted spoon, add the vegetables and chicken thighs to 1 or 2 sheet pans in a single layer. Don't pour the remaining glaze or you'll have boiled not roasted food. Every 10 minutes or so, brush with remaining glaze. Roast until chicken juices are clear (160-165 degrees internal temperature). Vegetables should be tender. 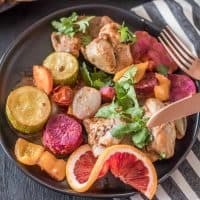 I have done this dish with beets and loved it, but my husband didn't like it with the glaze. You can mix it up a bit, but think about how the glaze will combine with your preferred veggies. Also, be sure to account for cooking times. If you like brussels, slice in half lengthwise. Cauliflower? Break down into small florets. Beets? Slice them thin. You get the idea, right? As I mentioned in the post (you did read it right? ), blood oranges are in season now in my area. Substitute cara cara, tangerines, clementines, etc. Macronutrients are an approximation only from MyFitnessPal.com. I used 20 ounces of chicken thighs, and added about half of the glaze into the calculation. 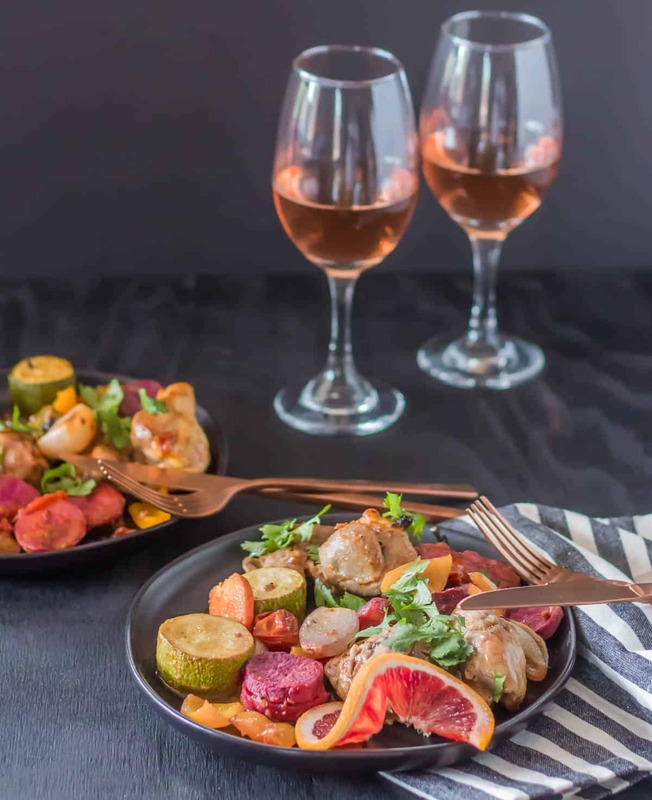 We enjoy Sheet Pan Chicken Thighs with Citrus-Chipotle Glaze with a dry Spanish rosé. If you prefer a craft beer, a farmhouse saison is a lovely option!